Received this beautiful photo from Italia Magazine. 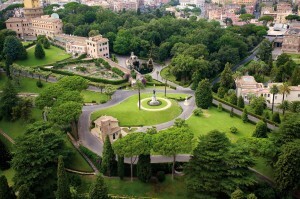 I will be visiting the Vatican Gardens on November 15. The gardens cover about 57 acres, which is most of the Vatican Hill. The gardens and parks have a history going back to the Renaissance and Baroque periods. Filled with fountains and sculptures there are also several underground springs. We will have a private historical guide and I’m sure to learn some amazing things to share with you. Hoping for a sighting of Pope Frances! Amazing view! The garden is really wonderful!